The largest of our Luxury Savannah Bed Breakfast rooms here at the Foley House Inn. 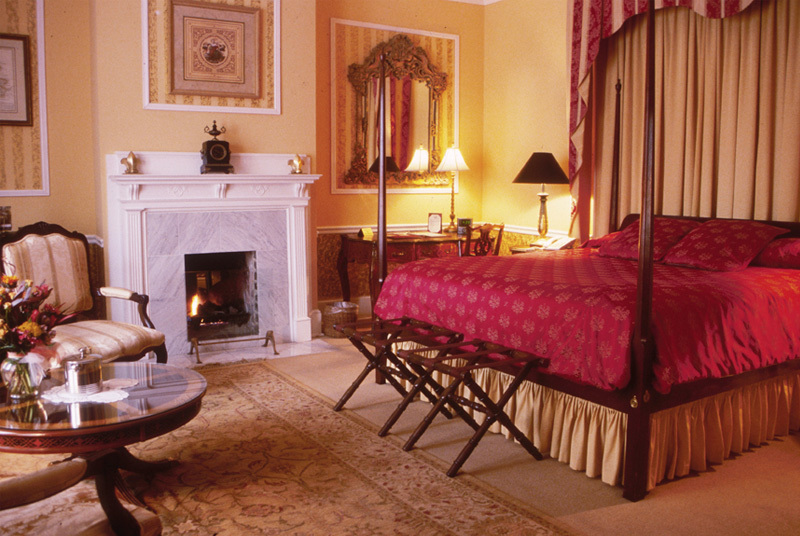 You will be greeted by a plush four-poster king size bed. There is a large bay window overlooking Chippewa Square. This room has two separate sitting areas. 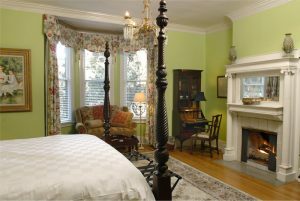 It features two fireplaces, private bath, oak hardwood floors, period rugs to keep your toes warm. There is a 32-inch HD television for your enjoyment. A Jacuzzi tub in the bathroom with soft robes and plush towels make this room fit for royalty. All available to you at this Luxury Savannah Bed Breakfast. Click on the image for a larger view. The original 1858 master bedroom of this elegant Luxury Savannah Bed Breakfast. The room is done in pale yellows with a bay area overlooking Chippewa Square of Savannah, Georgia. It features much original art. Also a French beveled mirror, antique writing desk, 32 inch flat screen HD television. 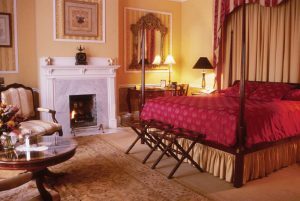 The room has a private bath, king size British Period four poster, canopied bed. Plus the original marbled working fireplace. There is a twin pull-out sofa bed in this room. The bath has an over-sized bath with a corner Jacuzzi for two, and a private balcony overlooking Chippewa square. Click on the image for a larger view. 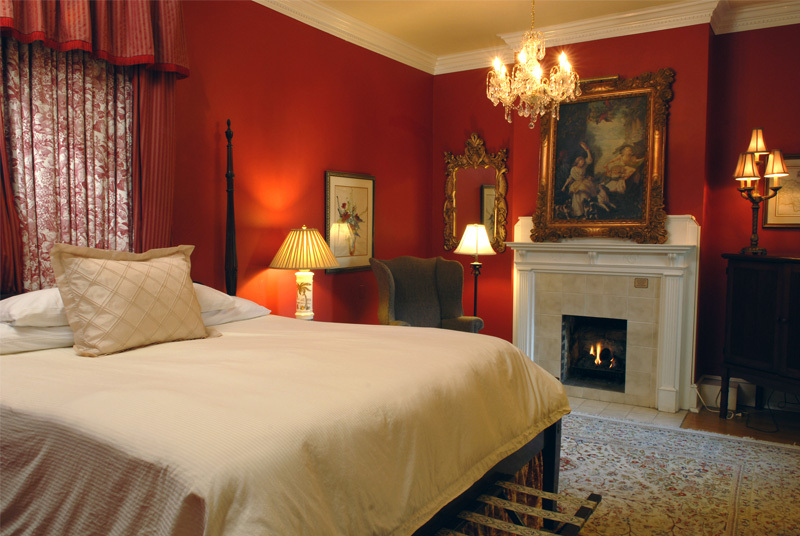 A cozy romantic Luxury Savannah Bed Breakfast room done in dark, lush reds with antique white moldings and working fireplace. This Luxury Savannah bed and breakfast room features a large private balcony overlooking our grotto courtyard and Savannah Georgia Fountain Pond. It also boasts original art, 32 inch flat screen HD television, an English king size bed with Portuguese bedcover, and a private bath with oversized walk-in shower. Perfect for indoor and outdoor intimacy. Click on the image for a larger view.